Available NOW on Kindle. Paperback out soon. “Writer and philosopher Stelian Turlea based his crime fiction GREUCEANU on a well-known Romanian fairytale, in which the eponymous hero battles with a number of Zmei [ogres], to bring back to the skies the sun which they had stolen. The novel transposes the fairytale to the reality of a provincial town which has been taken over by gangsters, now the town's masters. Greuceanu is a young policeman, at the bottom of the ladder. By chance, he gets rid of one of the feared gangsters, whose brothers and their wives come after him. 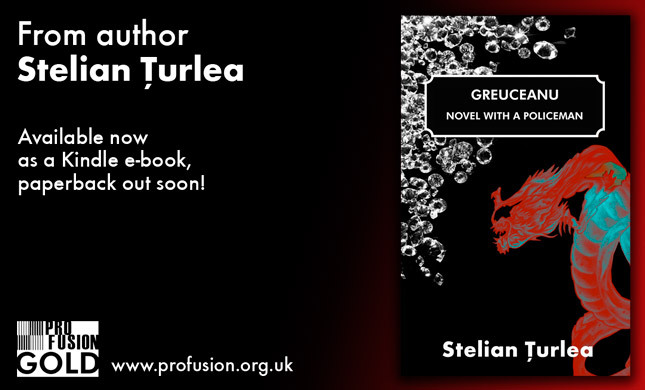 Greuceanu - Novel with a Policeman is Stelian Turlea’s first novel published in English. Published originally in Romanian as “GREUCEANU – roman (cu un) politist” (Crime Scene Publishing, 2010). Born in January 1946, Stelian Turlea studied Philology (1968) and Philosophy (1976) in Bucharest. For nearly three decades, he has been editor on external affairs (“Lumea” magazine). After 1989, he coordinated “Lumea”, “Zig-Zag”, and “Meridian” magazines, and worked in television as Head of Antena 1 News Department. He has been working for ProTV since 1996 and, since 2000, he has been a senior editor for “Ziarul de duminică”. He is the author of eighteen novels, ten books on journalism, nine books for children and two translations. He has coordinated six photo albums (a three-volume album about Bucharest during the reign of Carol I; other albums are: The public works during the reign of Carol I; The Palace of the Patriarchy; The Royal Palace; B.N.R. – Chronicle of the Old Palace Restoration; The Financial-Banking, Historical Centre of Bucharest). He received the Writers’ Union Award for Children's Literature (2003), the Romanian Editors’ Association Award for Children's Literature (2005), the Writers’ Union Special Award (2006) and the Bucharest Writers’ Association Award (2007), Flacăra Prize for Literature (2011). He was nominated for the Writers’ Union Award for Children's Literature in 2000 and the AER Novel Award in 2003.